Soaking a copper penny in lemon juice makes an old penny look new. Lemon juice removes the copper oxide coating. Adding salt to the lemon juice will clean the penny more effectively. This simple experiment is an easy way to demonstrate some basic scientific principles about oxidation and chemical reactions to children. Place a penny in a nonreactive cup or bowl. Cover the penny with about an inch of lemon juice. Bottled or fresh-squeezed lemon juice will work. Wait five minutes, then remove the penny from the lemon juice. The penny will get cleaner the longer it sits in the solution. Wipe it with a white paper towel. Any remaining dirty coating, which is actually copper oxide, will rub off as an orange stain on the paper towel, leaving the penny clean and shiny. While the coating on a dark penny may look like dirt, it is actually a chemical compound called copper oxide. The copper in the pennies combines with the oxygen in the air to create a new compound, copper oxide. The amount of copper oxide on the pennies will vary depending on how they have been stored, how old they are and how much copper is in the pennies. 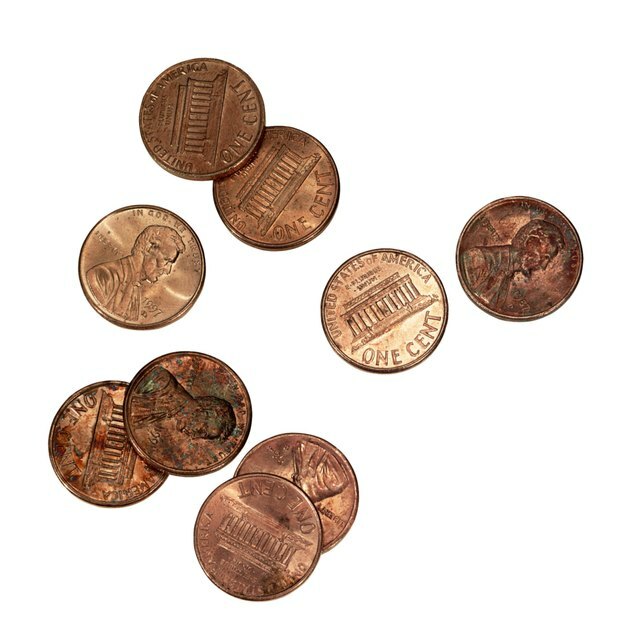 Pennies minted between 1962 and 1982 work well for this experiment, as they contain 95 percent copper and have been in circulation long enough to build up a coating of copper oxide. An acid solution weakens the bonds that formed between the copper and oxygen atoms to create the copper oxide. Citric acid, contained in lemon juice, is a weak acid that will break those bonds. The experiment can be repeated with other acids, such as vinegar. The phosphoric acid found in some sodas will also dissolve the copper oxide. The effectiveness of the lemon juice in dissolving the bonds can be improved by adding salt to the juice. Adding table salt, or sodium chloride, to the lemon juice creates a chemical reaction that increases the number of free hydrogen ions in the solution. This increased ionization increases the strength of the acid, allowing it to remove the copper oxide faster and more completely than can be done by the lemon juice alone. MacDowell, Susan. "What Happens When You Clean Pennies With Lemon Juice?" Sciencing, https://sciencing.com/happens-clean-pennies-lemon-juice-8135684.html. 13 March 2018.